Operate handle (A) as shown by the arrow to open the compartment. A coin tray may be found on the dashboard on the central tunnel according to the versions. The slots for holding magnetic cards and tickets (phone card, toll slips, etc.) can be found on the central tunnel unit. glove compartment open: risk of passengers’ injury in case of accident. Press button (A) with ignition key at MAR. After approx. 15 seconds it will return to its initial position and is ready for use. IMPORTANT Always check that the cigar lighter has turned off. IMPORTANT The cigar lighter gets very hot. Handle it with care and make sure that it is not used by children: danger of fire and/or burns. Pull the flap towards yourself. Remove the ashtray (B) by pulling it upwards as shown by the arrow for emptying it. 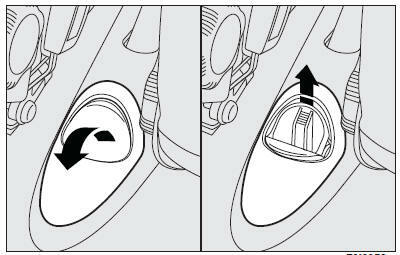 For rear passengers there is a concealed ashtray set on the central console. Pull it as shown by the arrows for use and removal. IMPORTANT Do not use the ashtray as waste paper basket: it might set on fire in contact with cigarettes stub. Non smokers can remove both the front and rear ashtrays and use the handy oddment compartment which results. They are located at the sides of the driving mirror. They can be adjusted forwards and sidewards (this last adjustment is not possible on versions fitted with Front window bag). A courtesy mirror is applied to the back of the passenger’s side sun visor. On some versions, the driver’s sun visor is fitted on the back with a courtesy mirror: Lift the lid (A) to use the mirror. push the lever back until it clicks. To close the windows, pull the lever to the opposite direction until it clicks.